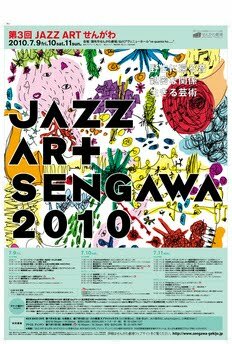 There is an official announcement that three additional concert will be offered for Jazz Art Sengawa 2010. The artists are Nanao Tavito, Ogawa Mishio and Umezu Kazutoki. Curiously, all of them happened to have some connections with Hikashu and already performed with the band in the past. Please note: All those concerts are not covered with Jazz Art Sengawa 2010 ticket - you have to buy tickets or make reservations for each concert separately. But you will get some discount with showing Jazz Art Sengawa 2010 ticket. Nanao Tavito is a singer-songwriter, born in 1979 and debuted as a solo artist in 1998. Always relaxed, Nanao seems to be a man of easygoing but the power of his narrative singing is so immense and hard to resist. You have to listen to him for yourself. In January 2009, he performed a solo set as an opening act for Hikashu concert. I myself witnessed the performance - he was always smiling, frequently joking with the audience and sang a lot of songs - to me, it's like he was telling one long story continuously in various successive songs and it left me an impression that he is a modern day minstrel. After the solo act, he again appeared at the Hikashu's set, and performed 20+ minutes improvisation with the band and the other guest, violinist Ota Keisuke (he will also perform a solo set in Jazz Art Sengawa 2010). In the performance, he used no words - just voice and some effects - and I was greatly impressed. 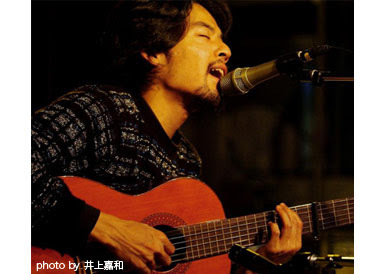 At Jazz Art Sengawa, he will perform a solo, and duo set with Makigami Koichi follows. He wrote an entry in his blog that performing with Makigami is a great challenge to him and looking forward to it. The seats are strictly limited so the reservation is recommended. Nanao Tavito sang "Terraplane" on May 29, 2009. Nanao Tavito and Jim O'Rourke dancing on John Zorn's Cobra, Jazz Art Sengawa 2009. Ogawa is a singer, debuted in 1980 as a vocalist of new wave band, Chakra. 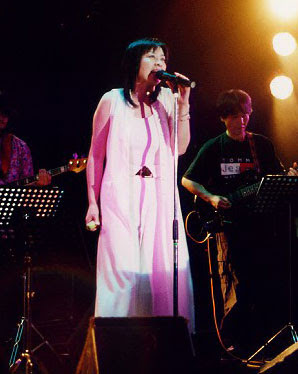 She is one of the best songstresses emerging from Japanese New Wave scene in late 70s - early 80s. Turned solo in 1984, she continues to perform in various projects to this day. For the festival, she will perform with her band, The Sproutrapus. The band's personnel is Ogawa (vocal), Yoshimori Makoto (keyboard), Okawa Shunji (bass), whacho (perc) and Kobayashi Takefumi (drums). Yoshimori is an ex-member of Hikashu. She has played with Hikashu many times in the past. The latest is in June, 2008. The band invited her and Inoyama Land their concert at Kichijoji Star Pine's Cafe and performed together. Chakra performed "Fuku no Tane" ("The Seed of Happiness") and "Sensei" ("My Teacher") in 1980. You might notice Hikashu members dancing in the audience. 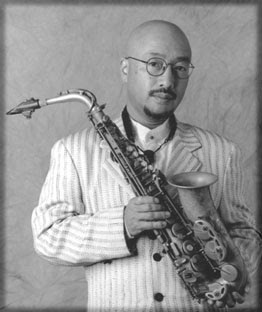 Started as an avant-garde saxophonist, Umezu is now one of the most popular reed player in the country. Besides jazz, he covers various musical style - rock, pops and so-called world music. The roster of his past collaborators is very long list - including RC Succession (he was a regular tour member of the very popular rock combo), Ian Dury & The Brockheads, and of course, Hikashu. He has appeared the festival in the past. In 2009, he performed a solo set, consisted entirely of Japanese Enka songs. Also he was guested in the Hikashu's set. This year he is going to perform solo again. In the notification of the event, there is no explanation of the performance itself so probably he will do free-form set. Umezu and His Kiki Band, 2006. The reissue of "Watashi No Tanoshimi"